MMP-9 levels were increased in blood and/or lung samples from IAV-infected human subjects and WT mice. (A) MMP-9 protein levels were measured in plasma samples obtained from human patients diagnosed with A/California/07/2009 H1N1 strain influenza infection (n = 66) or seasonal IAV infection (n = 10), or uninfected healthy control subjects (n = 14) using an ELISA. For subjects infected with seasonal influenza, samples were obtained within the first 2 weeks of onset of symptoms. For subjects infected with H1N1, samples were obtained during the first 30 days after they were admitted to the intensive care unit. *P < 0.001 versus the group indicated. 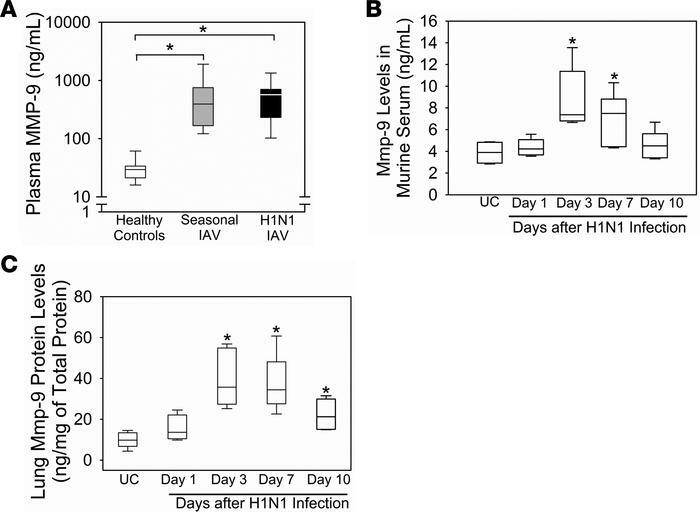 (B) WT mice were infected an LD20 inoculum of H1N1 IAV by the intranasal route. Serum Mmp-9 levels were measured in infected mice on days 1–10 postinfection or uninfected control (UC) WT mice using an ELISA (n = 5–7 mice/group). *P < 0.05 versus uninfected controls. (C) WT mice were infected with a LD20 inoculum by the intranasal route. At postinfection intervals, lungs were removed from infected mice or uninfected controls (UC) and Mmp-9 protein levels were measured using ELISA and normalized to total protein levels (4–5 mice/group). *P < 0.05 versus uninfected controls. All box-and-whisker plots show medians and 25th and 75th percentiles, and the whiskers show the 10th and 90th percentiles. All data were analyzed with 1-way ANOVAs followed by pair-wise testing with Mann-Whitney U tests.